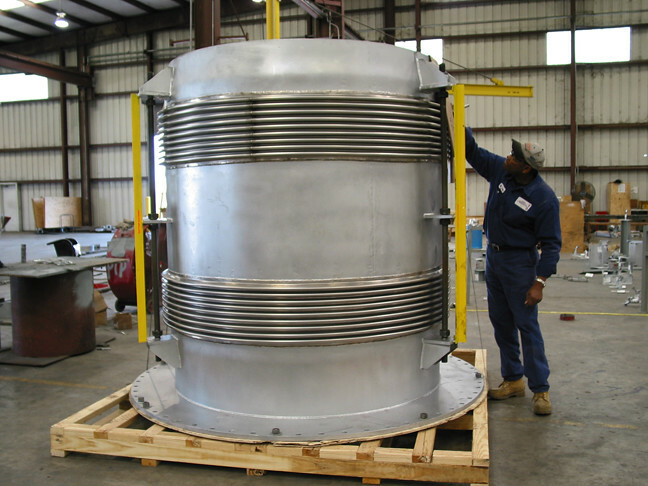 U.S. Bellows, Inc., recently designed and manufactured a 71″ x 84 universal expansion joint for a chemical manufacturing facility in Texas. The 3,000 lb. expansion joint was fabricated in just two weeks and replaced an existing expansion joint. This product was designed for 40 water column vacuum at 750ºF. The bellows and internal sleeves were constructed from Hastelloy C-276 and all other components were fabricated using carbon steel. The joints were 100% x-rayed and 100% dye-penetrant tested. An air test was performed at 3 PSIG for the entire expansion joint assembly prior to shipping.